DEUTSCH industrial environmentally sealed electrical connectors are for critical applications and are designed to withstand the harshest and most challenging environments. DEUTSCH AEC Series connectors are environmentally sealed, heavy duty electrical connectors that accept size 16 contacts. The AEC Series connectors are constructed of heavy duty thermoplastic and offer receptacles with either in-line or PCB mounting options. The DRB Series connectors are heavy duty connectors ideal for bulkhead applications. They are designed to accommodate multiple wire gauges and feature high pin counts, including 48, 60, 102, and 128 cavities. DEUTSCH DT Series connectors offer field proven reliability and rugged quality. The DT design strengths include optional flange mounting, multi-pin arrangements, lower cost, and design flexibility. Deutsch DTHD connectors are single terminal connectors for heavy duty applications. Easy to install, environmentally sealed and compact in size, they are a simple, field serviceable alternative to a splice. DTHD connectors are available in three sizes, carry 25 to 100 amps, and can be mounted or used in-line. The DTP Series offers the designer the ability to use multiple size 12 contacts, each with a 25 amp continuous capacity, within a single shell. The DTP connectors are currently available in two and four pin configurations. DEUTSCH DTV Series connectors offer the same time tested reliability and performance as the DT Series, with the added flexibility of an 18 cavity flanged design. TE Connectivity offers compact DEUTSCH circuit board enclosures that accept snap-in headers. The enclosure features a through hole mounting flange on each side, as well as optional venting. Designed with space to accommodate one or more DT or DTM Series interfaces, the headers feature 90° pins. A radial flange seal provides environmental sealing to the enclosure. The headers mate with the DT and DTM standard plugs. The Deutsh HD10 Series is an environmentally sealed, thermoplastic cylindrical connector series and offers arrangements from 3 to 9 cavities. All HD10 connectors are available either in-line or flanged and accept size 12 or 16 contacts, or a combination of size 16 and size 4 contacts. The Deutsch HDP20 Series is a heavy duty rated, environmentally sealed, composite shell, multi-pin connector. The composite thermoplastic shell is ideal in applications where chemicals can damage a connector housing. HDP20 features quick connect-disconnect bayonet coupling, single hole bulkhead mounting, silicone seals, and a rear insertion/rear removal contact system. 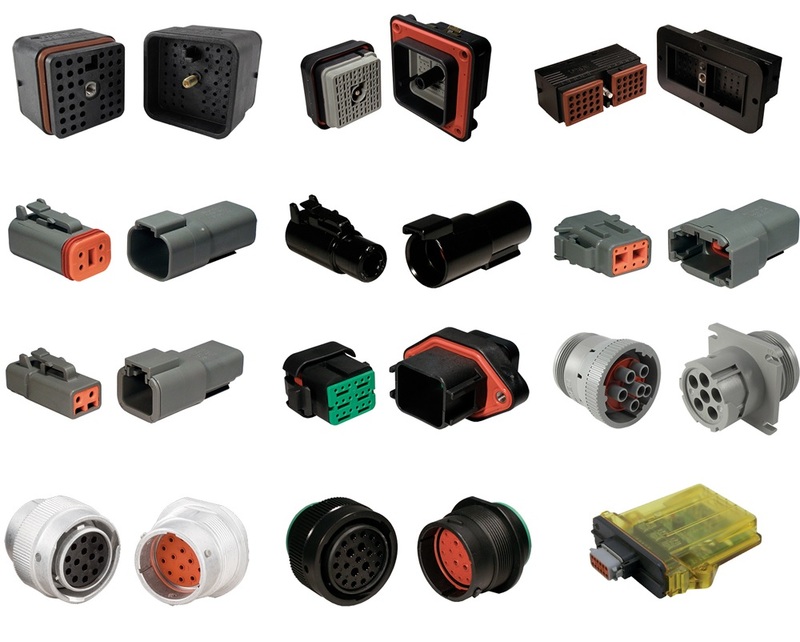 everal contacts are used interchangeably across most connector product lines. This commonality improves performance, reliability, and maintainability by reducing changes in the assembly of the wire harness. The use of the same contact systems eliminates many of the failures reported in harnesses where hundreds of different terminations are used. The solid contacts are designed for use with larger wire size and heavy-duty applications. Stamped & formed contacts are designed for use where wire termination costs are of primary concern without sacrificing reliability of electrical circuits.